At any rate, on previous visits and even soon after relocating to London from the US, I’d always assumed that as long as a flag was waving from a royal palace, it meant the sovereign was present. Well, I was wrong. And I don’t think I’m alone, so I think it’s worth explaining this aspect of the British monarchy. You see, the other day this week when my friend and I had visited Buckingham Palace, I noticed that instead of the usual Union Jack flag that I’ve seen there and at Windsor Castle, the colorful Royal Standard was flapping in the breezes. That is the cue that the Queen is in residence; the Union Jack is raised when she is not. England is symbolized by the three lions passant (horizontal) against the red background. Scotland is symbolized by the lion rampant (on its hind legs) against the yellow background. Ireland is symbolized by the harp against the blue background. In Scotland, the standard portrays two Scottish quarterings and only one English quartering. Wales is not represented in the standard given that it was already recognized as a principality via the Prince of Wales title. Britain’s Royal Standard flies not only from royal palaces, but on Victoria Tower (when the Queen is present at Parliament), the Queen’s car, airplane, and yacht, as well as any other building the Queen is visiting if its owner so decides. And unlike the Union Jack, the Royal Standard is never flown at half mast. The Queen also has her own personal flag, pictured to the left. 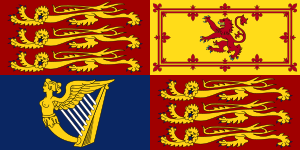 Whereas the Royal Standard represents the United Kingdom in addition to its sovereign, a personal flag represents the presence of only its particular sovereign and cannot be flown by anyone other than him or her.